Protest marches take to all major cities in Greece on Mayday. Big anarchist march in Athens smashes ISAP's entrance. Protest marches took the the streets of all major Greek cities on Mayday 2009: Athens, Salonica, Patras, Larissa, Lesbos, and Heraclion, Crete. 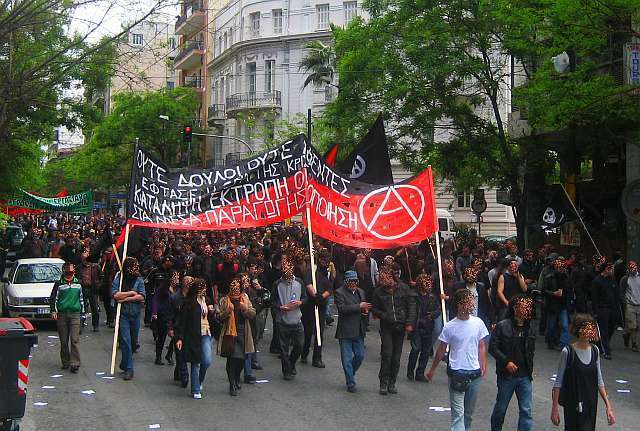 In Athens the independent march of anarchists, anarchosyndicalists and autonomous unions attracted over a thousand protesters in defiance of anti-anarchist measures. The "anarchist Mayday" protest marched through downtown immigrant neighborhoods that have been recently vilified by the government and the media and smashed the entrance of ISAP's headquarters were smashed. ISAP is the electric train public company that employed Konstantina Kouneva, the immigrant cleaner syndicalist who remains in hospital after an attack against her last December with sulphuric acid on the face. During the December uprising ISAP's HQ was occupied by protesters in solidarity to Kouneva and the cleaners' struggle. On the same day a protest march in solidarity to Kouneva also took place in Sofia, Bulgaria, with buses of protesters arriving also from across the greek border. At the end of the march, the protest was attacked by fascists but no protesters were wounded.